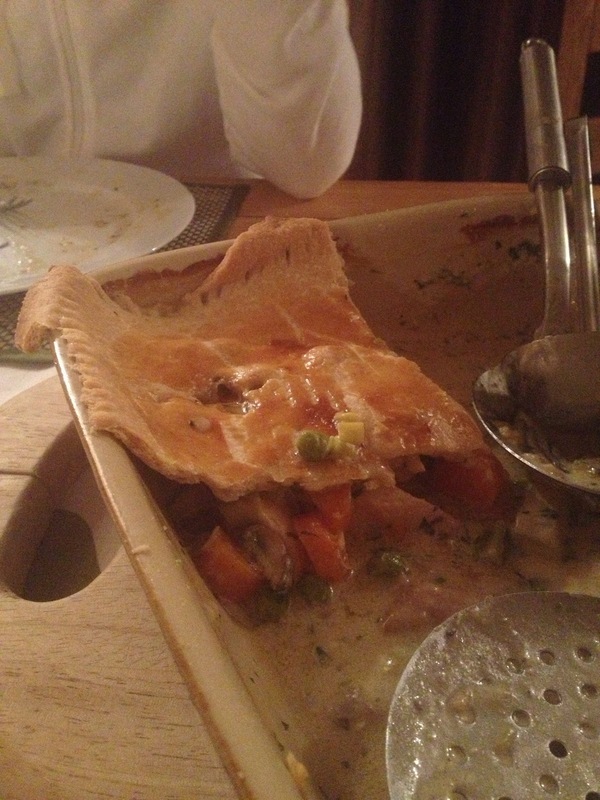 I first started making Chicken Pie when I lived at uni… we didn’t exactly eat like ordinary students in my house as we all really loved food and had a few budding amateur chefs in residence… rarely was there a ready meal or a super noodle in sight! We were a proper little family and we all cooked and ate together most nights. 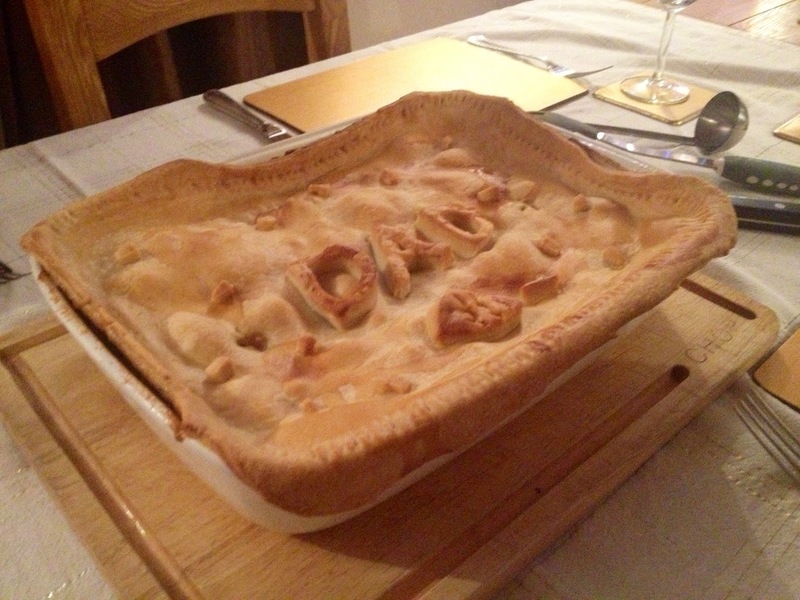 Each of us had our signature dishes and one of mine was chicken pie, so I know a few of my old housemates will be delighted to see the recipe up here… yes Ben I mean you! I hope you try it out and let me know how it goes. You can make you’re own if you have the time, I’ve not quite mastered pastry making yet (I’m sure there’ll be posts of me experimenting with it in the future) so I usually use the ready roll stuff you can buy in the supermarket, there’s nothing wrong with it and it saves time. Shortcrust is more traditional, but I often switch it up and make this with puff pastry as it’s my personal preference. You will need an egg and a splash of milk to brush over the pastry for a golden finish before putting in the oven. 2. In a large saucepan on a medium heat, melt half the butter before adding the onion, carrots, parsnip, leek and bacon. 3. Cook the veg down until softened, this should take about 10 mins. Keep an eye on it and stir occasionally. Remove the vegetables with a slotted spoon, set aside and cover with foil. 4. In the same pan, turn the heat right down and add the remaining butter and the flour, cook for about 3-4 mins, stirring constantly. The mixture will come together to form a roux, which will look like a soft paste, which will form the base of your sauce. 5. Stir in the stock and white wine and turn the heat up to bring the sauce to the boil. 6. As soon as the sauce starts to boil, turn down to a medium heat and add all of the veg you cooked earlier, the cooked chicken and the dried thyme. Mix together. 7. Add the cream, peas, mushrooms and fresh herbs. Stir the mixture together and season with salt and pepper to taste. Simmer for 2-3 minutes. 8. Transfer to a 2 litre baking dish, preferably with a rim to stick the edges off the pastry lid to. Cover mixture with foil to retain heat whilst you prepare the pastry. 9. Lightly flour a work surface and roll out your pastry to approximately 1cm in thickness or until it is large enough to cover your dish. 10. Dampen the rim of your dish then lay over the pastry, trim off the excess and gently press the with a fork around the edge to seal. 11. Use the pastry trimmings to create shapes and patterns to decorate. 12. Whisk the egg and milk together, using a pastry brush, brush all over and use this to stick the decorative shapes in place. 13. Make two holes in the crust, this will allow steam to escape while it cooks and will prevent the crust from bursting and breaking. 14. Bake in the oven until the pastry is golden brown, approx. 35 minutes and serve hot! This recipe serves 6 hungry students generously! I usually serve with buttered, minty new potatoes and broccolli or whatever greens I have to hand. I made this for my Dad’s birthday dinner this weekend, hence the corny decoration. I love this pie, I hope you do to! This looks lovely! I do love a good chicken pie, what's also nice to see is you haven't faffed about with it, it's good honest home cooked food, so much better than shop bought ones (which are a waste of time, money and pastry). Thanks Adam! Yeh it's one of those recipes that really doesn't need to be messed about with I think. Proper British home cooking. Hate the soggy things you get in the shops!